Given all this, one wonders why the Obama administration is in such a hurry to get this treaty cemented into law, other than impressing the peaceniks in the Democratic Party's base. Vice President Joseph Biden has gone so far as to assert, outrageously, that "failure to pass the New START Treaty this year would endanger our national security." This year? We can't wait 6 weeks? What's so urgent that we have to swallow this whole, without checking the ingredients? The urgency is that no one is monitoring the GODDAMN NUCLEAR WEAPONS! The 1991 START treaty enabled Americans and Russians to reduce their nuclear capabilities in a safe, measured, verifiable way. For twenty years, we have been cooperating to lower the huge insane threat our stockpiled destructive power represented into a more moderated insane threat. It helps ensure that the nuclear stockpiles are all accounted for, makes sure we don't risk a return to a arms race in any small way, and most importantly helps reduce the opportunities for a weapon to be lost or stolen. START ended in December 2009. Medvedev and Obama had negotiated a worthy successor that just needed a vote. It would have kept up our earned trust and verifiable safety. But it would have been a win for Obama, so the GOP opposed it. 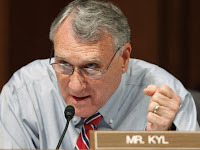 Obama crammed in pork to appeal some of them like Sen. Jon Kyl (R-Ariz.), adding $80 billion in arms upgrades and an additional $4 billion just for Kyl. But the Republicans - and Kyl - oppose it still, even after a year of deliberations and 21 hearings. They're calling it "rushed." And there have not been inspections going on in Russia for almost a full year - the first interruption for most of two decades of surety - while the GOP plays games. Russia has some 2,800-odd nuclear warheads, enough to destroy the planet many times over. Just one nuclear warhead stolen could lead to a catastrophe the likes of which we have never seen. They have hundreds of nuclear cruise missiles stored around their country, hundreds of buried silos not visible from the air, and hundreds of mobile silos. They are actively producing the RS-24 thermonuclear intercontinental ballistic cruise missile, having completed testing of them in July. There are hundreds of nukes. Now, I'm not particularly worried about Putin or his puppets. It's a problem, but not really a very serious one, despite the gradual remilitarization of the atmosphere in Russia and their perpetual problem with warlike strong men. I don't think they're going to run off and nuke us. But by the same token, it seems odd that Republicans are willing to just trust them on this. I'm about as liberal as they come (a "peacenik" as IBD puts it) and even I'm not willing to just take Russia's word about their nukes. They're researching new technology - that RS-24 I mentioned is equipped with new MIRV tips - and rolling out nukes all over. Even if they're not planning on launching any strikes, it doesn't strain my imagination that they want to have something a little extra stowed away somewhere. And we won't know about it. But far more serious to me is the threat of a nuke being lost or stolen by a terrorist organization or by some local splinter group. Keeping track of the warheads and their security is an important part of that, but most important is the reduction of the total stockpile, which doesn't effectively diminish our capability to destroy the world (yippee) but does give less opportunity for error. 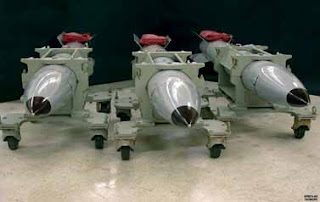 Every additional warhead stowed under sheet metal in Вы́борг is an additional warhead that could be stolen. I guess the "Hell No" strategy has worked so far for the Republicans, so maybe they can't be blamed for trying it. But it is just bizarre that they're willing to play so cavalierly with something so dangerous. Naturally, though, if someone manages to steal a nuclear warhead and does something terrible, it won't be their fault. At that point, it will be Obama's fault for failing to get this treaty confirmed in the Senate. Like they always do, they'll sit in the road blocking the way, shrieking at the top of their lungs and occasionally shooting at our tires, and then complain that the country isn't going anywhere. So let's be perfectly clear: START is not just a good treaty, it's a treaty that's important to keeping America safe. And not just the "keeping America safe" that leads to annoying airport scanners, but instead the kind that stops enormous thermonuclear explosions. The real kind. The Republicans seem to have forgotten that kind exists as they play their games.